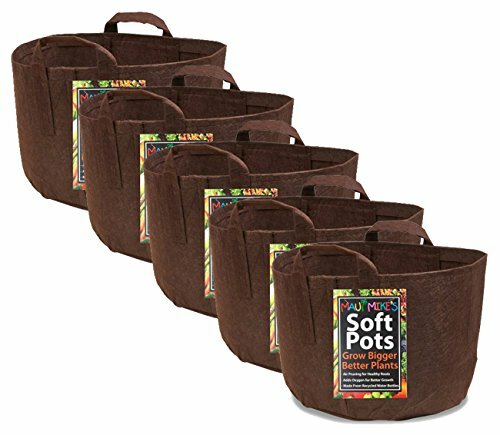 Best (7 Gallon) Soft Pots Fabric Pots allow air to flow to the Roots for Healthier Plants. Handles for Easy Moving (14w x 11 3/4" h). Grow Bigger and Faster Plants. Roots Stay Cooler in Summer and Warmer in Winter. Made from Recycled Water Bottles. Grow above ground to protect against Gophers and Moles eating the plant's roots. Faster and Healthier Plants. Tomato Plants produce more flowers and more Tomatoes. Veggie gardens thrive in Fabric Soft Pots. Size (14"w x 11 3/4 h) Handles for Easy Moving. Roots Stay Cooler in Summer and Warmer in Winter. Made from Recycled Water Bottles and Hemp. Eco Friendly. Can be used for Hydro planting too.